Volvo's Concept 26 (shown) was named to reflect the average daily commute to work of 26 minutes. The automaker says that time could be spent doing something more meaningful than sitting in stop-go traffic. Volvo Car Group, Swedish safety supplier Autoliv and their automotive software joint venture, Zenuity, are deepening ties with chipmaker Nvidia to develop advanced systems for the fast-growing self-driving car sector. The automotive industry is on track to spend $20 billion to $30 billion (18 billion to 27 billion euros) on autonomous driving technology in the next five years, IHS Markit estimates. Volvo will use Nvidia’s Drive PX processing platform to help it meet its goal of having an autonomous vehicle on the road by 2021. “This cooperation with Nvidia places Volvo Cars, Autoliv and Zenuity at the forefront of the fast-moving market to develop next-generation autonomous driving capabilities and will speed up the development of Volvo’s own commercially available autonomous drive cars,” Volvo CEO Hakan Samuelsson said in a news release Tuesday announcing the deal. The partners will develop systems that can utilize deep learning -- a form of artificial intelligence -- to recognize objects in their environment, anticipate potential threats and navigate safely. A key part of the alliance will be combining Nvidia’s artificial intelligence car computing platform with advanced software developed by Volvo, Autoliv and Zenuity. The partnership advances the relationship between Volvo and Nvidia, which have been working together on research and development efforts, to a production-level venture. “It’s a natural progression,” said Danny Shapiro, senior director of automotive at Nvidia, during a call with reporters, adding that Volvo has been working on Nvidia’s hardware to develop its self-driving technology. Preparing the autonomous driving system to be production ready by 2021 will be “an easy migration,” Shapiro said. 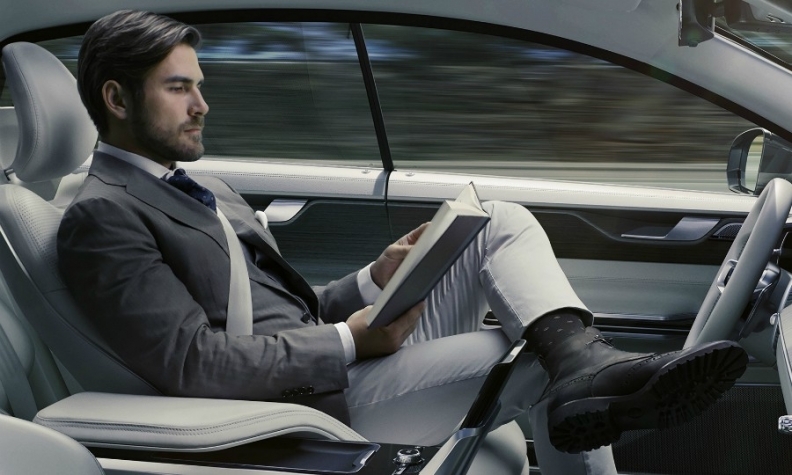 Zenuity will provide Volvo with self-driving software. At the same time, Autoliv will sell this software to other automakers using Autoliv’s sales, marketing and distribution network. Today’s deal is the latest mega-alliance formed as automakers, traditional partsmakers and suppliers of specialized technology join forces to make self-driving cars a reality. BMW is collaborating with Intel, Mobileye, Delphi and Continental to bring its iNext electric crossover to market by 2021. In April, Robert Bosch formed an alliance with Daimler to produce a fleet of driverless taxis. A month later Bosch announced it will spend $336 million over the next five years to develop artificial intelligence for self-driving vehicles. The world’s biggest supplier, with $46.50 billion in original equipment sales in 2016, generates annual sales of more than 1 billion euros ($1.12 billion) for the sensors, software and actuators needed for collision avoidance and self-driving vehicles. Bosch also plans to manufacture vehicle processors with Nvidia. Toyota Motor Corp. will also use Nvidia’s autonomous driving platform for its upcoming self-driving cars. Other automakers using Nvidia technology in developing autonomous vehicles include Tesla Motors, Audi and Mercedes-Benz. Volvo already has been working closely with Autoliv and Nvidia on the automaker’s Drive Me autonomous driving pilot program to test a fleet of 100 self-driving XC90s on the streets of Gothenburg, Sweden, starting this autumn. In separate announcements on Tuesday, Nvidia said it would cooperate with Volkswagen Group to help the automaker expand its competence in the field of deep learning and would be working with suppliers ZF Friedrichshafen and Hella to develop New Car Assessment Program-certified artificial intelligence systems for manufacturers.